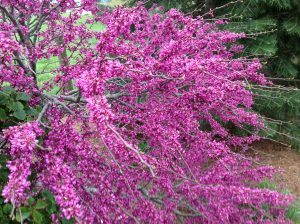 The Time for Your Spring Landscaping Evaluation Is Here! Time for your spring landscape assessment! First of all, hopefully you have completed your landscaping maintenance check list and are ready to assess the damage from Winter 2017. When we take that first early spring walk through our home gardens, we are often concerned and sometimes disappointed. Our grass may appear rich, green, and in need of mowing but our “woody” plants in our landscaping design may appear dull and somewhat burnt. We at Shreckhise Landscape and Design are here to remind you that turf needs only 3 to 4 days of warm sunny weather to start active growth. On the other hand, woody ornamentals require 2 and sometimes 4 weeks of warm days to “kick into gear”. What if my spring landscape is showing signs of damage? Don’t Be Alarmed! If you see scorched foliage as a result of a harsh winter in your front and backyard landscaping – don’t panic! Foliage often looks worse this time of year in home landscapes. You will discover that your landscaping will greatly improve in mid-April or into early May. Remember that woody ornamentals and trees take longer to start their growth process. You have probably invested much time and money in your residential landscape design. Here are a few simple tests to prove the viability of your shrubs and reveal their true condition. 1. Bend the twigs. Flexible twigs mean that there is activity within the plant. 2. Scrape the twig bark with a knife. (A fingernail will work as well!) Green sap under the bark indicates life is present. Healthy plants are green and moist under the bark. 3. Look for new buds. They may be no bigger than a pin head but new buds are a great indicator of the health of your plants. You may scrape a few buds off the twig. Again, it should be green and moist. Dead plants do not produce new buds. So what happens if I discover plant damage in my landscape? If the plant stems are brittle and the tissue under the bark is dry and brown then check another branch. If several branches appear lifeless, then replacement of the plant may be necessary. In some borderline cases, you simply have to wait. One thing for sure is that woody ornamentals (check out our selection at Shreckhise Landscape & Design) will change between now and early May. They will either slowly die OR produce new growth. Sometimes, you simply have to be patient, wait, and see. Feel free to contact Jim or Trent if you have any concerns about your residential or commercial landscape and to get fresh landscaping ideas for assessing your large and small garden designs. http://shreckhiselandscape.com/wp-content/uploads/2017/04/TF-Cercis-_DSCN6456.jpg 2532 1748 Shreckhise Landscape & Design /wp-content/themes/shreckhise-enfold-child/images/logo_tag.png Shreckhise Landscape & Design2017-04-18 09:20:552017-04-18 10:02:33The Time for Your Spring Landscaping Evaluation Is Here! Shreckhise Landscape & Design is proud to announce a rebrand! Check out our new name and look. http://shreckhiselandscape.com/wp-content/uploads/2017/02/Shreckhise-Portraits-and-Lighting-3-2-2017-1054-2.jpg 868 1300 Shreckhise Landscape & Design /wp-content/themes/shreckhise-enfold-child/images/logo_tag.png Shreckhise Landscape & Design2017-02-18 09:41:332017-03-06 13:07:08Check Out Our New Look! What Are The Advantages of Landscape Gravel vs. Natural Mulch? Many customers inquire about mulching their shrubbery beds with landscape gravel instead of mulch in an effort to eliminate annual mulching. It is correct that once gravel is installed, it can last for a decade or more. Gravel can control weed growth, make mowing easier, and be esthetically pleasing with a minimal investment of time. However, degradable mulches such as pine straw and wood bark offer many advantages. Natural mulches make it much easier to make changes and additions to your garden. They greatly enhance the soil and nourish the plants as they decompose. Most plants tend to grow better with natural mulches as a cover because they provide a cooler surface. When used around environments containing concrete, brick, stone, and other hard surfaces, organic mulches create a much softer, natural feeling. On the other hand, landscape gravel tends to create a glaring, institutional feel. Gravel tends to have disadvantages at a much greater initial cost. It is difficult to work with as plants grow and beds need to be widened. In order to use gravel, a landscape fabric is also required as a base treatment. The greatest expense involving gravel comes 10 to 15 years later when it has to be removed and replaced. Both types of mulches are susceptible to weed growth. In our opinion, the organic mulches are much kinder to plants and more pleasing esthetically. We love to use boulders and waves of natural stone as accents, but unless there are special needs, we overwhelmingly prefer a natural type of mulch such as stained shredded hardwood or pine straw (needles) over the landscape gravel. Now is not the time….. This time of year our customers often ask if it is a good time to trim the ir shrubbery. After a fantastic growing season, many shrubs have “above normal” new growth and homeowners worry about their plants becoming too big. Although this is true, there is really little additional growth after the middle of July (most plants will stay the same size until next spring’s growth flush). When shrubs are pruned, new growth is stimulated. By pruning shrubs in middle and late summer, we take the risk of this new growth not being hardened off and ready for fall frost. If this happens, many shrubs will be damaged and will turn black after the first killing frost. Remember these rules of thumb: Flowering shrubs should always be pruned after flowering has ceased for the year. Ideally, evergreens should be pruned just as they enter their growth flush in the spring. It never hurts to “pinch” shrubs to encourage the more desirable shape. Frequently, we run into homeowners who are frustrated in staying ahead of weeds germinating in their landscaping beds. Because of this year’s great growing season with above average rainfall, like turf, weeds grow faster than ever. Many homeowners try to combat this by hand pulling weeds out of the mulch beds. Often this is anti-productive because breaking the weed roots leaves sections of root intact in the ground and merely serves to propagate the weed. It would be much easier and more effective to spray undesired vegetation with Roundup (glycophosphate). By using this systemic herbicide, the entire plant is killed. The easiest and most economical way to handle this product for homeowners is to purchase a backpack sprayer and a 2.5 gallon container of Roundup. This size container offers a great price advantage and is usually sold in more concentrated formulas. Roundup has a long shelf life (several years) as long as it is not allowed to freeze. By using a backpack sprayer, a person can work more efficiently because the weight of the pesticide container is spread evenly across their shoulders making it possible to carry more herbicide at a time. The upright posture is much more comfortable and the sprayer can be pumped while walking, eliminating the need to stop and pump. Spot herbicide spraying should become part of routine maintenance. Every third or fourth time the lawn is mowed, the homeowner should selectively spray for weeds in plant beds. As always, standard precautions should be taken regarding personal safety and avoiding spray drift. Roundup is most effective at killing grass like weeds but does a reasonable job when sprayed on the foliage of most plants. To avoid herbicide damage, hold the spray nozzle close to ground level pointed away from the desirable, ornamental plant material. It is helpful to use the outside of your leg to hold shrub branches back and then spray inside your ankle. Back pack sprayers and Roundup can make quick work of pesky weeds! Do I continue to water after all of the rain? and the answer is….YES! With all the rain it may seem like watering is wasteful and unnecessary. Yet, when the sun shines and the wind blows – plants, especially new plantings, dry out quickly. The rule of thumb: new plants should be watered twice weekly under normal summer conditions. Evergreen plants typically require lesser amounts of water while large, flat leaf, deciduous plants require more. In rainy conditions we often expect plants to have a greater water supply than they really do. Remember that plants draw a water reserve from the 3, 5, 7, or sometimes 15 gallon container root ball they were grown in. When the supply of water is consumed, the plant will begin to wilt regardless of how much available moisture is sitting beyond that root ball. Consequently, new plants still require watering during rainy periods for maximum health and growth. Established plants have roots that extend far beyond their original growing container, therefore, supplementary water is not as critical. Keep in mind that when plants are heavily mulched, it takes a lot of rain (more than an inch) to penetrate the surface and hydrate the root system. The first signs of wilting appear in the form of soft, silvery, floppy leaves on the new growth. Watching for this is helpful during the summer months. Evergreens will not show this. Hopefully this will help you understand which plants need water and why shrubs and trees need supplemental watering, even during rainy periods. /wp-content/themes/shreckhise-enfold-child/images/logo_tag.png 0 0 Shreckhise Landscape & Design /wp-content/themes/shreckhise-enfold-child/images/logo_tag.png Shreckhise Landscape & Design2013-06-14 18:51:032017-03-06 09:01:58Do I continue to water after all of the rain? It is time to start watering your landscape! Plants use twice as much water at 80 degrees as 70 degrees and four times as much water at 90 degrees as 70 degrees. Newly planted shade trees (planted within the last year) will show minor signs of stress like scorched leaf margins. This is normal for a first year tree. Regardless, the higher temps of summer make watering a necessity in maintaining healthy trees and shrubs. It is also a good time to raise your mower cutting height. Due to the increased effects from heat and drought, turf can handle more stress when it is cut higher. By increasing your mower cutting height, you help the grass compete against possible weeds. Obviously, we want the grass to win that battle! If you did not get around to your fall landscaping clean up, then February into March is a great time to complete that task. Removing the leaves that seem to collect in unsightly areas, trimming roses, hydrangeas, butterfly bushes, etc. can be accomplished now. I was able to tackle this project last week – blew leaves on to my lawn, mowed and vacuumed up the dead grass and leaves in the process. It’s a great feeling to get a “jump” on spring and your landscape always has a neater appearance afterwards. Generally speaking, you can stop watering at the same time deciduous trees begin dropping their leaves – usually mid-October in our area. When the daily high temperatures are less than 70 degrees most plants begin to become dormant in preparation for the winter season. Normally supplemental watering is not needed after this point. There is one exception with newly installed plants. Occasionally watering is needed if we have experienced a fall drought. In these cases, we would recommend watering weekly into mid December. Fortunately, this is not the situation this year. For established landscaping, we recommend one watering before the end of December to prevent winter desiccation. The best way to prevent winter injury is to have healthy, moist plants going into the more severe cold period. Most hydrangeas, roses, grasses, butterfly bushes and other summer blooming plants can be pruned any time after they become dormant. This requires a (hard) freeze with temps in the lower 20’s. There is no rush to do this. Some folks like to see the dormant flower heads throughout the winter. The real deadline for pruning these plants is before the spring growth begins. I often prune my plants on a warm day after January 1. It is detrimental to prune spring-flowering plants (spirea, lilac, azaleas, forsythia) at this time because you will be removing the spring flower buds.